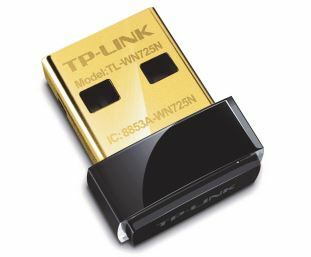 TP-LINK TL-WN725N Wireless-N Nano USB adapter allows users to connect a desktop or notebook computer to a wireless network at 150Mbps. It's convenient to be used for lag-free video streaming, online gaming, and secure Internet surfing. With its miniature size and sleek design, users can connect the nano adapter to any USB port and leave it there. There’s no need to worry about blocking adjacent USB interfaces or that the adapter may fall out when moving a connected laptop from one location to the other location, with the tiny device flush against the USB port. This TP-LINK TL-WN725N wireless usb adapter also features advanced wireless encryption (WPA2) and easy installation (wireless configuration utility). Find out more about this usb nano adapter here if you want to learn more ! My laptop's wireless card is a piece of -- well, you can guess. I looked at some super expensive wifi adapters and then at this one, and thought, well, for $10, how can I NOT try this first? And: OMG. I love it. Previously, I could not be further than about 15' from our home's router. My study, about 20' away: frequently zero reception. Even when connected, the connection would time out sporadically and interrupt my work or uploads (I do a lot of high res photo stuff so this was more than annoying). NOW: Full bar connections anywhere in my 1200 sq ft apartment. Consistent connection. WAY faster download/upload speeds. FYI, laptop is a 2014 Sony Vaio running Windows 8.1. Plus, this is such a wee little thing, I don't even notice it plugged in. Could not be happier. I'm sure this is made in horrible Chinese factories and should feel really guilty about the artificially low cost...but. I'm a terrible person and am really just happy I have it. On my older Windows 7 laptop, the TP-Link N150 was easy to plug in, but I needed to install the driver from the CD that was provided. Not a big deal. After the driver was installed, I rebooted my PC and the adapter easily connected to my WiFi. I ran a speedtest and got 20Mbs/5Mbs up - so about the speed of the adapter and I was happy with that. My problem is that WITHOUT moving my laptop around, the network would drop, then reconnect. It did this numerous times, even with a 85% plus signal strength. I tried uninstalling/reinstalling the driver, updating the driver, powering down, even tried different USB ports. No luck - so I returned it and am going to try the TP-Link AC450 and hope it's better! Somehow I tend to go through a lot of Wireless adapters... I have 3 of these now after burning up a couple other brands and they've been working just fine so far. I bought the first one as a backup and a cheap simple way to get a computer I might be working on connected if it doesn't already have a (working?) adapter. But now I have 2 in regular use and keep the 3rd one in my toolbox as a spare. The range isn't that great but works for me right now, my router is probably 10 feet from me on the other side of a thin wall. If it's not a similar case for you then you might want to go for one with better range, I doubt any low profile dongle excels in that area. But for the size and price you really can't go wrong having one of these as a backup. Edit 3/3/16: Still have one of these in near constant use and it's doing as well as expected. I'm still a little miffed about the range on it, it really seems to slow down and get finicky if you don't have a relatively clear path between it and the router (by this I mean no metal or brick between them, wood is okay). I gave one away and still have the third one in my toolbox, it's really a life saver. The only reason I'm not giving it 5 stars is because I literally had to put one on a USB extension and place it on top of my desk to get reception, just because that computer was in the floor instead of on the desk. This was with the same setup I described before, the router being one room away. Maybe it was just weird electrical interference in the house, but I don't remember having that issue with the larger ones. I carry a couple in my bag all the time now. Having been in IT for over 20 years I have come across several weird situations were a laptop/PC just doesn't like the WiFi radio it's connecting to. The most recent was a laptop that just wouldn't stay connected to brand new Cisco equipment. This laptop was literately within 25 ft of a new AP and would not stay connected no matter what I did. Add one of these little monsters, turn off the built in radio and problem solved. This is a little better than my Sony Vaio Duo 13 internal card that has a lousy antenna. It just works on Windows 10, if you plug it in and select it in Wifi settings once, it will work well. If you then plug and unplug it will switch over to the nano whenever you put it in. However it is 2.4 GHz only not 5GHz. It is very small but the body is smooth and glossy with not even a fingernail slot, so extremely hard to pull out of the port once it's in there. Maybe I will glue a little pull tab on it or something. Return to top of "TP-Link TL-WN725N Wireless-N Nano USB Adapter"! !